If you’ve visited here for any length of time you’ll notice I have a love affair with potatoes and the Buffalo Wing Sauce. I love putting that sauce on and in many recipes and I do love a good potato. When I was asked to create a potato salad recipe using the Idaho® potato I jumped at the opportunity. First it’s what we always talk about, real food. A potato is a single ingredient, a no label food. Well it will say if it’s an Idaho® potato and it will say if it’s organic or not. For my money I’d always stick with organic for potatoes. They are one of those foods on the EWG dirty dozen and organic is becoming easier and easier to find just about anywhere. Before I go any further let me just say you are going to LOVE this recipe. It’s extremely versatile and you can even create it with leftover cooked potatoes and chicken and it’s a complete meal on a plate. How cool is that! Talk about saving you time and money. I don’t know about you but I’m up for both of those. This is also a great potato salad to brighten your winter, take to a spring baseball game, bring as a potluck for a summer picnic or tailgating at a football game in the fall. It’s a four season recipe. Using your Idaho® potatoes work great in this recipe especially if you like the hot wing sauces. The potatoes work to cool your tongue off from the bite of spicy sauce. If you really like it extra spicy I might suggest you use a ranch dressing for the potatoes and greens instead of the simple oil and vinegar I’m using here. You might need that extra buffer. This is also a great recipe if you are looking to add more greens into your day. I’m sure you’ve heard how wonderful kale is for you but maybe you have yet to venture out and give it a try. When you go to the store and see there are a few varieties and you’re just not sure about it. I would start with the dinosaur kale I use in this recipe as I find it less intimidating and easier on the tongue for those who are first timers. I played around with this salad and created it a few different ways but with the same ingredients. It just depends on what you have on hand and what shapes you like. Yes I said what shapes you like. Potatoes do come in different shapes. There are the typical oblong, some are round and then there are those adorable fingerling potatoes. They also come in different colors like golden, creamy white and purple. I couldn’t find any purple for this recipe but that would be my first choice if I was a Clemson fan who’s school colors are purple and orange. But using these creamy white potatoes I’d say this was more of a University of Tennessee salad. I expect to see this recipe at a few tailgating parties next football season. Please use this recipe as a guide to the process instead of recreating it ingredient for ingredient. That means you can change up the protein, the greens or the potato and you’ll have a different salad every time. You can even change up the sauce and take it in a totally different direction. Imagine barbecue or any other grill sauce. Whatever sauce you are using from a bottle please read the labels to make sure there are no ingredients you wouldn’t want to eat in there. Or you can always make your own sauces like my Chipotle BBQ Sauce. When choosing your greens think about picking something that is sturdy like the kale if you are mixing it into the salad. If you’re just using it to hold the salad than you can something a little more delicate like a Boston Bib lettuce. Just be careful it’s still sturdy enough to pick up. I usually gage 2-3 big leaves of greens or 1-2 handfuls of smaller greens per person. As for the protein and a Buffalo Wing Sauce I tend to gravitate towards chicken but trust me it’s great on shrimp, pork and tofu or polenta if keeping it vegetarian. Did I mention I like to use this sauce a lot? You can even change up how you cook the protein either in the oven, on the stove or even the grill. As for the potatoes you can use the different varieties mentioned above. I’ve even changed up the way I cook the potatoes in this recipe. Often I use boiled potatoes but I also have used roasted wedges and grilled planks. I served them and the chicken warm in this salad. Yet another option, warm or cold. Now if you’re looking for a little extra crunch in this salad consider mixing in sunflower seeds or pumpkin seeds. Both add nutritional value and texture to the salad. If adding these I would sprinkle them on top and not mix them in. One last option to toss at you. If you make this salad lets say for lunch or dinner and you have leftovers no problem. If you are using the kale it will keep for a day or two. 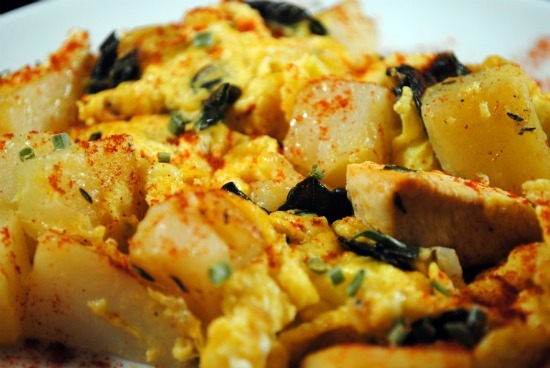 But you could get up for breakfast and toss it into your skillet to crisp up the potatoes and soften the kale. Warm up the saucy chicken and you have breakfast. You could even toss in some scrambled eggs and make it a party. So have I given you lots of options, now here is how I created what you see. Cut your chicken either into cubes or long slices and toss in a 1/4 cup of the wing sauce. You can use the traditional Frank’s Wing Sauce or I’ve used Wing-time Buffalo Wing Sauce (read the label as some contain dairy). It’s a little thicker and clings to the meat more and it’s bright orange. Use your favorite sauce. Spread chicken out onto a cookie sheet with sides, lined with parchment paper. Bake in a pre-heated oven set to 425 degrees for 15-20 minutes or until your chicken is cooked. It will depend on the thickness of your chicken on how fast it cooks. You can now keep your chicken warm or cool it off in the refrigerator. While that is cooking wash your kale. Remove the center stem by holding the stem with one hand and placing your fingers on either side of the stem and pulling down the stem. The leaves should slide down and off of the stem and almost cut in half. Finish that cut and stack them onto your cutting board. Then cut your kale into strips. You can have long or short strips depending on which direction you cut. I like to grab a jar with a lid to mix the dressing. Pour in the oil, vinegar, thyme and just a pinch of salt. You can always add more. Put the lid on and give it a good shake for about a minute. This will help the mixture emulsify. Put the kale into your mixing bowl and pour in some of the dressing. Now dive in with your hands and massage the kale. This will help tenderize the kale and also make sure it’s all covered in dressing. This is great fun for your young helpers. Now toss in your potatoes, green onions and a little more of the dressing and combine. You may not use all of the dressing, it just depends on how much kale and potatoes you have in the bowl. You don’t want them swimming in dressing, just kissed with it. Make sure you give it a quick taste to see if you want a little more salt. You can add in pepper too but keep in mind the heat level of the wing sauce you chose. I like to place my chicken on top of the salad so first I plate the mixed greens and potatoes. Then I top it with the spicy chicken. Feel free to add the seeds now if using them. I like to toss the chicken in a little more sauce just before adding it to the salad to brighten it up and of course get more of that sauce. Wow, this look so delicious Diane, I have pinned it to give it a go…my family has a farm of Idaho potatoes! 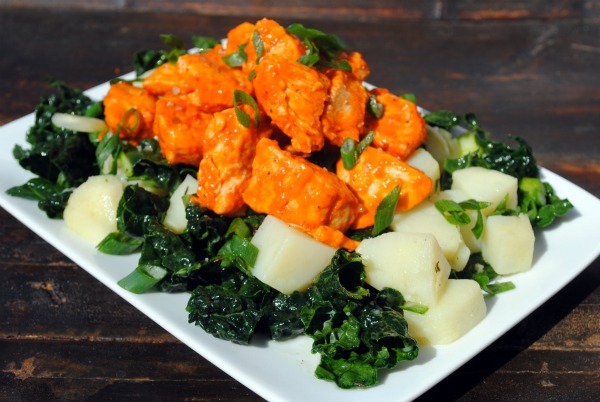 Oh Diane, I always love your buffalo chicken recipes! I need to make one soon. We've been on a hiatus from lots of heat, but lately, this stuff is sounding more enticing.